I have never gone to the eye doctor and had a good visit, or had them tell you all is well see you in 2 years. Man that would be nice. But reality is that every time I go to the eye doctor they tell me what I already know or give me bad news. Yesterday was no different, I went they did the regular tests, pictures, pressure, measurements that sort of thing. Then in I go to see the eye doctor and they put the big E up at the end of the room, “can you make out what is up there ” part of me wants to blurt out E, I know it is a E for god sake. But I try as hard as I can to make out that lovely E and nothing. Then she hands me a card hold this as close as you need to and tell me what you can make out. So I squint and hold the card so close I know I look ridiculous and nothing. She takes the card and sets up the machine to look at my eyes and check if there is a prescription that could work and nothing. Surprise ! NOT. Why they feel the need to tell me that things are progressing and getting worse, like I didn’t know is beyond me. I know my eyes are getting worse without you telling me this. In case you didn’t realize I open them every day to see not a heck of a lot. Trying to explain to family and people around me what I see and don’t see is hard. I have never in my life had good eye sight, I have been legally blind since birth, so I have no idea what you see, so for all I know I am missing nothing at all ! And truth be told I like it that way, it keeps me sane. This is my world as I know it and I can not change it so why not just live it the way it was meant to be lived. My family and I went camping on the weekend and my kids and husband were watching a squirrel in the tree, my kids were saying look mom look mom and I started to laugh and my husband asked what is so funny. I began to tell him that I have never in my life been able to see a squirrel in a tree or a bird in a tree for that matter, he asked well why when I used to say look at that squirrel did you say oh cool. So I started to tell him how it was just easier, it sucked saying umm I can’t see that when someone pointed something out so I just went along with it. It didn’t matter to me if I could see it and it didn’t seem all that important to point out the fact I had no idea what they were talking about. He looked at me like I had two heads but I think he is starting to understand how I feel and why. I used to pretend like I could see things that he could and never really made a note of what I couldn’t see. Now that my sight is to the point where there is no hiding the cane or how I feel around for things I hate the pity, the stares, and the condolences I get. I don’t want pity, or condolences I am still here enjoying life and living it to its fullest. I may do it in my own way and I may be experiencing it differently than you but I am still experiencing it. To see your world does not define weather you are living it or not. To see your world is only one way to experience it. It has been a crazy few days, the weather has finally turned around so we have been able to spend some time camping and hanging out in the back yard with the kids. The biggest thing that has happened though is Friday I had my home interview for a guide dog from Guide Dogs For the Blind. This is the last phase of a process that started at the beginning of February. In a couple weeks I should hear if I am going to be able to be matched and go hopefully in August to get a guide dog. This is a very exciting thing for me. I have considered getting a guide dog since my first year of University in 2003, so this has been a long journey that is for sure. I seem to keep running into people who feel the need to show their ignorance in full force. They will think that I can not hear them and almost shout at me, while speaking to me like I am 5. Or like today just say things that they think I can not hear. For example I was out for ice cream with my husband and kids, a lady that i have known for quite some time she used to work for my parents, was sitting at the table next to us and when we got up to leave she says to her husband loudly “oh she has a cane, I heard she was going blind.” I usually don’t let people bother e but I have had enough lately, so in response I said ” Yes, and I heard it doesn’t affect my dam hearing.” and continued to walk away. I wish that people would talk to me, ask me the questions, I am not a child and I do not have the plague you can not catch blindness from treating me like a human being. I believe these things don’t need to happen in this day and age. This is another reason for this blog, the only thing that will change the way that people treat others in by education . I would like to take this time to introduce myself. My name is Ashley Nemeth I am 29 years old and live in Saskatchewan Canada. I am a wife and mother of 3 lovely children. I have decided to write this blog to help myself and hopefully anyone else going through the same things through these times when your mind is full and you don’t know where to go. 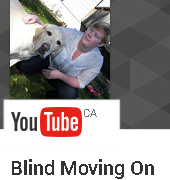 I have been visually impaired from birth due to Ocular Albinism . This made growing up odd at times as I was teased a lot about my eyes moving and not being able to see many things that all the other kids could. I had to use enlarged text books in school and had a teachers aid, I also used a computer that had a screen reader on it and a lot of other things that brought way too much attention to my differences. Now that I am older I have tried very hard to live a normal life and tried not to make it a known fact that I could not see very well. I usually failed at this and people found out but I have come to terms with this. A lot of the reasons that I try to keep it to myself or tried is because of the ignorance of people. One would think in this day and age that people would be open and understanding to people with all kinds of disabilities and differences but this is not always the case. In the last 4 months my vision has decreased greatly so that I now only have about 5% of my vision left. This has greatly impacted my life, I had to leave my job and am now having to figure my life out all over again and decide whatI want to be when I grow up. I have had no choice but to use my white cane and this brings a whole other can of worms with it. There is this stigma that I can’t seem to get rid of with my cane, people see it and assume I am deaf and stupid and speak to me as if I am 5. I am neither of these. I am very intelligent and capable, and I sure am not deaf in fact I hear very well.